The Leeds Network has alumni profiles ranging from freelance radio presenters to directors of Pricewaterhouse Coopers and volunteers are continually being recruited to ensure you find inspiration. There are two search options to find alumni profiles. The basic keyword search looks at the text in volunteer profiles. Keywords can be combined to narrow a search e.g. 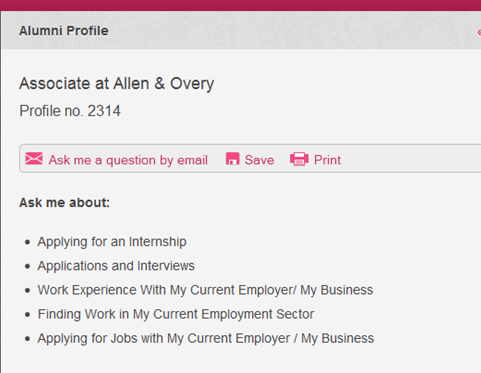 You can simply read the career profiles or if you have particular questions you can contact alumni through the Network. Any alumni willing to answer questions will have a note on their profile. You can ask 20 questions per calendar month, relating to career and professional development. 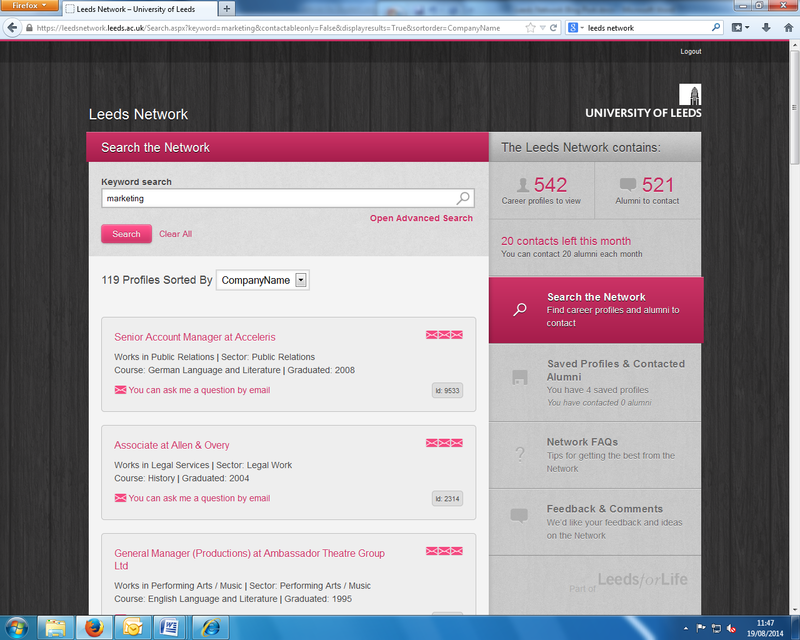 At the top of a profile you can see a selection of topics alumni have chosen to answer questions about. Tip: Read their career profile carefully to make sure that the information you seek has not already been answered. Take a look on their company website or the employer record on the Careers Centre’s vacancy & events system. When you first send a question it sends internally through the Leeds Network. Their reply will be sent to your university email – here you will see their contact details and any further conversation will be through personal emails. Do not expect a reply straight away; you should usually get a one within a few days. Obviously if they are on holiday or away from work for other reasons you may have to wait. Think and prepare any questions you want to ask. One second-year French student did exactly this. She contacted a director at Rothschild with some thoughtful questions on the firm’s culture and distinctiveness, and what makes a good CV. She got extensive help; the email led to telephone discussions, and ultimately an offer of further help with internship applications and CV advice. Tip: Alumni will only see your email address when you send a question, so remember to use your name when you sign off. Remain professional – you’re talking to someone you do not know. Be positive and genuine about yourself, this may help you to make better use of the Network and retain connections. Prepare questions you would like to ask – do not just jump in asking any questions, decide exactly what you would like to know. The more prepared you are the more you will get out of it. They may not have all the answers – ask politely if they know alternative sources that may be able to help. Do not ask for a job – it is not the point! Alumni have volunteered to share their expertise and experience not organise work experience or a work permit to get you a job. Do not worry, even if you have recently graduated you can still use this great service. Current students and graduates from the last five years can search and contact alumni by email. You may also be interested in “Linking in to Alumni” which outlines how you can use LinkedIn™ to find alumni, explore career paths and find out what other graduates of your degree have gone on to do.